Special Shipping Note: Packages over 1 cubic foot in volume going to destinations beyond USPS Zone 4 will be shipped by UPS Ground or rarely Parcel Post, regardless of shipping method chosen or paid for. USPS charges a "Balloon Rate" turkey charge (same rate as 20lbs) for large light weight packages. A Slow Stick kit to California by Priority Mail cost about $30 to ship. This policy only applies to orders containing larger kits, ARF's, radio systems, larger power supplies and similar bulky boxes 1 cubic foot or larger. Big amp power supplies guaranteed over 88mph. Banana socket box and rubber feet included. Each one Doc builds could look a little different depending on hour and day of assembly. All will be equipped with double standard 4mm banana inputs or better. Made from re-manufactured and new components. Tested in our shop under load prior to shipping. Doc says if he has time, he can configure the outputs differently if you like. 30 day guarantee by Doc included. Note: Power supplies take sandard PC type power cords. Most people have 3 or 4 in a drawer somewhere just waiting to be recycled to a good use. This is an excellent place to employ one of the extra cords you've been saving. If you need one, please choose in the dropdown below. The 18 gauge cord is light duty and should not be used if you'll be taxing this power supply above 20 amps. The 14 AWG cord is a heavy duty server grade cord and will run cool as a cucumber even when you've got this unit maxed out. Both are 6 feet long. Banana socket box and rubber feet included. Each one Doc builds could look a little different depending on hour and day of assembly. All will be equipped with double standard 4mm banana inputs or better. Made from re-manufactured and new components. Tested in our shop under load prior to shipping. Doc says if he has time, he can configure the outputs differently if you like. 30 day guarantee by Doc included. Special Notes for the HAM hobby:Radical Workbench Blog Post. Note: Power supplies take standard PC type power cords. Most people have 3 or 4 in a drawer somewhere just waiting to be recycled to a good use. This is an excellent place to employ one of the extra cords you've been saving. If you need one, please choose in the drop down below. The 18 gauge cord is light duty and should not be used if you'll be taxing this power supply above 20 amps. The 14 AWG cord is a heavy duty server grade cord and will run cool as a cucumber even when you've got this unit maxed out. Both are 6 feet long. 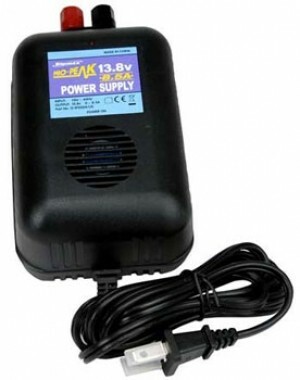 Power your chargers and other 12v items from a benchtop power supply. Has standard 4mm banana/binding post inputs. 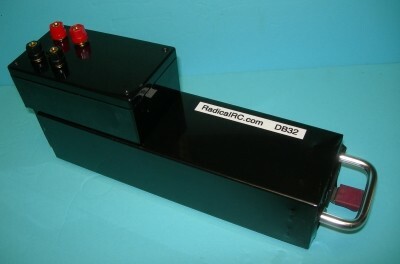 This is a "switch-rate" type unit so it's light weight and easy to pack to the field or indoor fly-in. 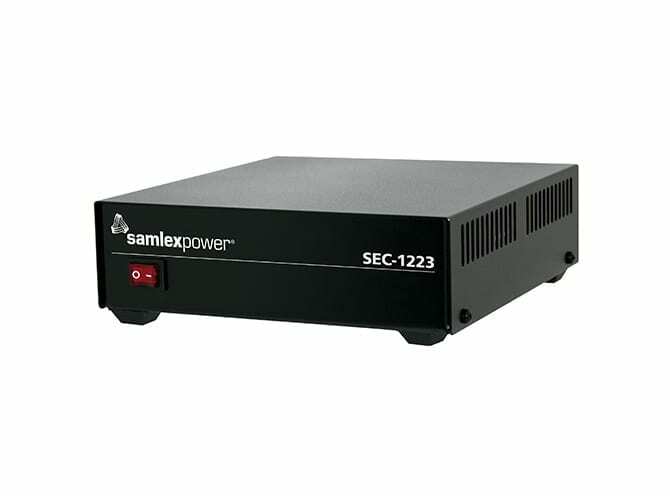 23 amp continuous duty switching power supply with 25 amps peak output. Switching power supplies are light weight and more efficient. Suitable for most bench power supply applications and general purpose applications. Use to power almost any fast charger. The SEC1223 should handle these examples well, 9 Lipo's (30 cells) at 6 amps, 5 Lipo's (16 cells) at 11 amps, 3 Lipo's (10 cells) at 20 amps. Also, any pack under sub C size at any rate and cell count you want. Remember, the charger has overhead which means it draws a little more than 4 amps when charging 10 cells at 4 amps. Great power supply for nearly any application. Stackable banana plugs. Can be plugged into each other allowing multiple items to be connected simultaneously to your field box or power supply. Multiple useage, heavy duty. Priced per pair, one red-positive and one black-negative. Really come in handy installed on your gear. 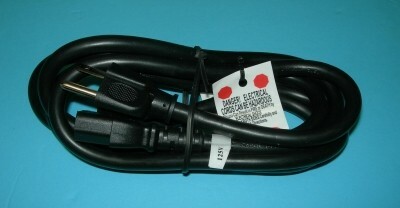 Heavy Duty IEC-C13 Power Cord fits many power supplies including our DB 32/47/94 series above. A requirement when the power supply is feeding a charger working on multiple 6 cell or 8 to 12 cell packs at very high rates. Standard Duty IEC-C13 Power Cord fits many power supplies including our DB 32/47/94 series above. Use this lighter weight cord when your demands from the power supply are under 30 amps DC.